I spent three days devouring the world's best-selling book on permaculture, Toby Hemenway's "Gaia's Garden: A Guide to Home-Scale Permaculture." Through the efforts of the Southeastern Michigan Permaculture Guild and Food Gatherers, Hemenway will be coming to Matthaei Botanical Gardens on May 22-23 to share with us practical tips on how to turn our landscape into a garden that allows us to be self-reliant. The book is a dense compendium of practical advice and riveting information about our ecological world. I took away that the basic notion of permaculture is that if you build a plant community or a collection of communities in your landscape that work together in a symbiotic relationship everything (soil, insects, microbes, water use, plants, etc.) benefit exponentially. 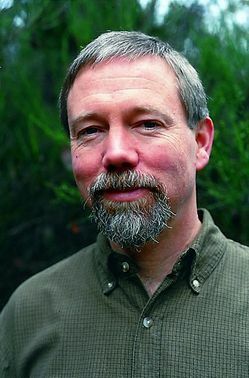 Hemenway is leading two workshops: "Designing and Installing a Food Forest" and "Permaculture Solutions for City and Suburb" at Matthai and giving a lecture and book signing on at 7 p.m. May 21 at the Ann Arbor Library titled How Permaculture Can Save Humanity and the Earth, but not Civilization. Kris Kaul, of Southeastern Michigan Permaculture Guild, describes her excitement about an author of Hemenway's stature coming to town. "We have been working to make more people aware of permaculture as a holistic, solution-oriented way to design sustainable ways to live on the Earth, whether in the city or in the country, and having someone of Toby's stature come to our area is fantastic. And it turns out he spent some of his childhood in suburban Detroit (his father was in the auto industry), and he has 'many good memories of the land, lakes, and people.'" Hemenway answered a few questions I emailed to him in anticipation of his arrival. Q: You say in your biography, you grew "dissatisfied with the direction biotechnology was taking" and "discovered permaculture. " What, direction in particular, gave you pause? The techniques of biotech and genetic engineering are very promising. But nearly all the GE products being made for agricultural use are not needed and exist solely to gain monopolies on seeds and other products, or to encourage farmers to buy more pesticides. This was not an industry I wanted to contribute to, even though I was in the medical and not the ag side of it. Even in the medical side, the products we were working on at that time (1990s) were designed to allow stronger doses of conventional treatments to be given, although that has changed now. Q: When you and your wife first started working towards your own permaculture site in rural Oregon, what mistakes did you make in the first few years? Lots. We tried to do way too much, on too big a scale. So start small. We bought land that had very thin, infertile soil even though our goal was to garden, because I knew I could build soil, thus insuring me years of work that could have been avoided. Get the best soil you can, and be clear about your goals: if you want to grow plants, get land suited for that. If you want to restore abused land, be clear that that is truly your goal, because you won't be growing much food on abused land for years to come. Also, we didn't have a good water source, and it turned out our land was not good for pond digging (cracked sandstone just below the surface that wouldn't hold water). We did not live in a supportive community; we were the liberals in a very conservative area and didn't fit in. We bought it (in 1993) because it was beautiful, and I thought permaculture would fix everything. It did (except the community) but it took a lot of work that could have been avoided if I'd started in a place that would have supported my goals better. In short we were very ignorant about how to choose land, and let our surface goals (it's pretty!) outweigh our deep goals (we want to homestead!). I had not taken a permaculture design course when we bought the land--I had just done a good bit of reading about it, which was not adequate. A permaculture course would have saved me years of work. Q: How much of your food comes from your own garden? Right now, only a few greens, since we are moving and I did not start annuals this year (first time in 35 years!). When we had our rural place in southern Oregon I'd say half our veggies came from the garden, and once the trees matured, half our fruit. But we never grew grains, meat or dairy, and if you aren't doing that, you can never provide more than 20% of your calories from your garden unless you live on potatoes. Once I realized this, I abandoned the viewpoint that I must grow some particular percentage of my own food. I grow what's fun to grow, and that's my recommendation for everyone, and will remain so until we have a serious food crisis. I don't think anyone should feel compelled to grow food; that should come out of love and a desire to garden, or maybe from a need to save money. The point is to take care of your food needs responsibly and sustainably. I have been growing much less food since we moved to Portland, since there are so many farmers markets here and we belong to a CSA, and I'd rather support farmers than be one. I'm also affiliated with many school garden programs, and they load me up with bags and bags of produce at every visit. This evolution has occurred because I have learned that the gardening part of permaculture is a very small part of it: it's just the entry room that most people see first, and then, if their eyes are open to it, they see the dozens of other rooms. Permaculture is whole-system design and applies to water, energy, shelter, justice, politics, community, economics, and anything else that can be designed. The garden is the first and easy part, and I've mostly moved into the other rooms. But I'm happy to show people the entry where the garden is. Q: You share that 14% of crops today are lost to insects whereas 50 years ago that loss was 7%. You posit that doubling of loss is due to soil fertility, loss of hedgerows, and the use of insecticides. For those of us not working as farmers, do you have suggestions for ways we can help shift this trend? Plant insect habitat. Buy from farmers who create habitat and who build soil. Don't give your money to people who do evil with it. Cut down on consumption, as that's the real habitat eater. Don't eat processed food, as the crops and farms that it comes from are the major killers of biodiversity. Know where your food (and everything else) comes from. Q: You say, "intervention is the problem" with removing fast growing thickets of "opportunistic plants. " We have a community dedicated to removing garlic mustard from our parks and woodlands in and around Ann Arbor, what would you tell them? They will be working forever unless the conditions that favor garlic mustard are changed. Here in Portland, garlic mustard is being sprayed several times a year in a wildlife refuge that is a wetland, which is stunning to me. The program has been going on for years with no sign of success, because the annual flooding (caused by a flood-control system run by a different bureau) creates disturbance that favors the garlic mustard over the natives they are trying to install. First, I would have them really examine why the garlic mustard is there: why is it better adapted to the conditions than the natives they want to have? I assume something has changed that now favors garlic mustard, or else it could never compete with well-adapted natives that have been there for centuries. Second, I would make sure that the natives they want really are adapted to the current conditions at the site, or they will always need life support. Just because it's a native doesn't mean that it can survive the site conditions. (or is the garlic mustard growing in grass or other non-natives--I hope not!) And third, really be honest about whether it is the garlic mustard that is the problem, or just their hatred of the plant. Garlic mustard is edible, supports a wide array of pollinators and beneficial insects, and eventually gives way in succession to other species. It's not evil. Continued disturbance (weeding and spraying) will prolong the presence of garlic mustard. One argument is that it pushes out other species, but natives are always pushing each other out as time goes by (Michigan was all birches and aspens not long ago, pushed out by today's natives), so really the problem there is that it is pushing out species that we prefer for various reasons, some of them reasonable and others just prejudice. Nature will use whatever species are best adapted to the conditions and she has chosen garlic mustard there. She has no preference; that's just a human idea. In other words, think ecologically about the problem, rather than starting with "I want to get rid of garlic mustard." The plant is there for a number of very good reasons. Figure out what they are. Q: As a city dweller, I am very grateful your book includes ideas as what we can do with our small plots of land, and your description of your "neighbor's yards" becoming your "orchard" when you moved to Portland glows idyllic. Do you have advice for permaculture devotees whose neighbors are not gardeners? Back to the earlier answer: support farmers markets and local CSAs. Help create a data base of urban fruit trees that need harvesting (see the Portland Fruit Tree Project for an example) See if your neighbors want to be involved in yard-shares, where other people come and garden for them (these are being set up in cities all over the country). And be a good model: have a beautiful yard that inspires them, not a mass of mulch piles, lumber, and exposed cardboard mulch. To register for the workshops and for more information, visit the SE Michigan Permaculture Guild website or contact Kris Kaul at 734-644-1520. Here is the link to the article in annarbor.com.